Whether in conference rooms, offices, or workspaces, the simplicity and high-quality craftsmanship of Novel Tables bring form and function to your work environments. In addition to the corrosion-resistant duplex nickel chrome finish, all Novel bases are available in dozens of powder-coated epoxy colors. This paint process fuses and oven-cures the coating, making it impervious to scratches and scuffs while providing a smooth chemical resistant finish. Coordinating laminate tops complete the look. Folding bases are available in multiple sizes of T-and TT-legs, while flip-top models come in X-leg and T-leg configurations. Both are great choices for multipurpose rooms. 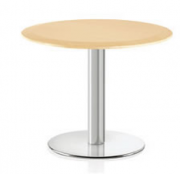 Multiple sizes of T-leg and TT-leg fixed bases suit a variety of traditional table shapes and purposes while showcasing the bases’ sleek design, but casual spaces especially benefit from X-legs in two column diameters. Strong 14-gauge steel components make every option a durable one. To protect the rest of your space, Novel bases also come standard with adjustable nylon-tipped glides under the legs, which can be upgraded to self-levelling glides for total stability on uneven surfaces. Its timeless form makes Novel’s E-Base an intelligent choice for any work space. The tubular steel legs and columns are precisely cut and brazed for a look of seamless strength that is only enhanced by the optional chrome finish. Folding-leg models are designed with the same sturdy components as the fixed-top bases, and snap firmly in the fully open position for security and stability. In the closed position, the legs fold tightly against the tabletop for compact storage. An optional bumper protects tabletops from dings and scratches when they are stacked. Novel’s E-Bases are also available with flip-top mechanisms that are spring-loaded for easy use, while a locking device provides secure vertical storage. Folding Leg – T- and TT-legs can be ordered with a folding option. T-legs can also be ordered with a flip-top for more storage options. Gangers – Secure tables into any desired configuration with these easy-to-operate gangers. Instead of conventional round tubes, Novel’s P-Bases feature elliptical legs for a touch of contemporary elegance. Poly end caps and column caps in a variety of colors elevate these bases from a supporting role and make them part of the décor. The folding legs of P-table bases snap securely into place to prevent shifting in storage. Optional hinge bumpers protect other tabletops from scratches whether they are stacked vertically or horizontally. Flip-top models are designed with a locking mechanism that lets you easily and safely vertically store one table or several. 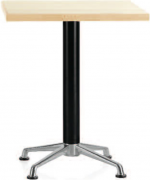 Folding Base Mechanism – The leg locking plate holds the legs in a secure position when the table is folded. Flip-Top – Flip-top tables allow for easy storage. Cable Management – Tables have the option of cable management systems. 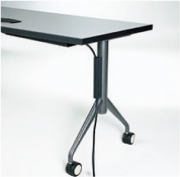 A black velcro harness attaches along the table base to clearly route cables. Novel’s T-Base tables provide a contemporary look and offer multiple design options. 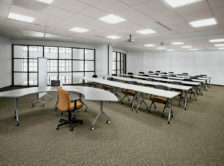 Arrange tables in traditional, linear layouts or innovative configurations. With square, round, rectangular, racetrack and boat shape models, you have incredible options with T-Bases. Folding leg tables feature seam-welded tubular steel legs that quickly fold flat within the frame for easy storage. Legs are equipped with a safety lock to prevent accidental movement. Adjustable, distinctive glides complement the unique leg profile and set the line apart. You can also choose durable, smooth casters. The angled profile of the leg is a significant departure from traditional “floor-hugging” bases. This new design direction extends beyond the base. Flip-Top Mechanism – All T-Base flip-top tables can be nested for efficient storage of multiple tables. Modesty Panels – are available as an option on many of the rectangular shaped tables. Available in a folding or quick-release option. Folding Mechanism – Built of 11-gauge, black zinc finish steel, legs fold tightly to table bottom and securely lock with two polypropylene clips. Leg Wireway – Assists in running wires vertically down the leg to the floor. Wire Management – A wire management trough is available to discretely hide and direct wires underneath the table. Available in a 29″ standard seating height as well as a 42″ café height, A-Bases can be used to add depth and visual interest to community spaces and casual gathering areas. Contemporary steel columns in 3″, 4″, and 5-1/2″ diameters can accommodate tabletops from a cozy 24×24″ square to an expansive 60″ round, and easily coordinate with existing environment. Both the disk and X-leg configurations include adjustable thermoplastic glides for additional stability on uneven floors, and the high-quality steel and cast aluminum materials provide durability that outlasts cast iron and closing time. As with all CORCAN furniture products, our Novel Tables can be custom-ordered to suit any environment. Our design and manufacturing professionals will be happy to help you build the solution that takes your workplace to new levels of comfort and performance. 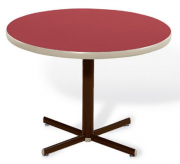 Contact us today for details about CORCAN Novel tables. Mechanical and electrical parts are warranted for a period of five years.